Sometimes, as a reviewer, I'm surprised by how short an album actually can be. Take this Dethfox for example. Once I wrote the first paragraph, half of the album was already over. So let's try again, this time I put the album on endless repeat so I won't get overtaken by something weird like silence. 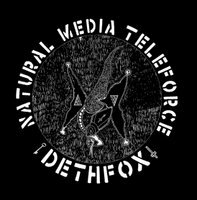 Natural Media Teleforce is the band's debut and even though it lasts less than ten minutes, it's a bomb. In five short songs Dethfox spews out some of the most disturbing anarcho-punk I've heard since the days I attented parties at squatted houses. That's exactly what Dethfox reminds me of. A band playing in a former living room that is now spray painted with anarchist slogans. There's is cheap beer (Karlsquell) or even cheaper wine. In the garden there's a toilet over a hole in the ground with an improvised tent 'for privacy matters' (you don't have to flush, the next person's poo will cover yours). Inside, it smells like sweat, beer and piss. There's probably some fungi spores being inhaled and I'll be glad if I make it out alive. But it's awesome. It's anarchy and freedom and it's partying like it's your last day on earth. Dethfox is raunchy, loud and constantly seems to be a bit pissed off. This is the stuff true punks will really appreciate. They have the good ol' street attitude from early punk rockers and combine it with the dark and mysterious sound of the Misfits. A few songs could have been written by the Ramones but that's actually what everybody can say about every punk song so that's no big surprise. What is a surprise is the fact that I've been playing this e.p. five times now and it still hasn't lost any of its intensity and power. I can even start singing along with some of the songs.